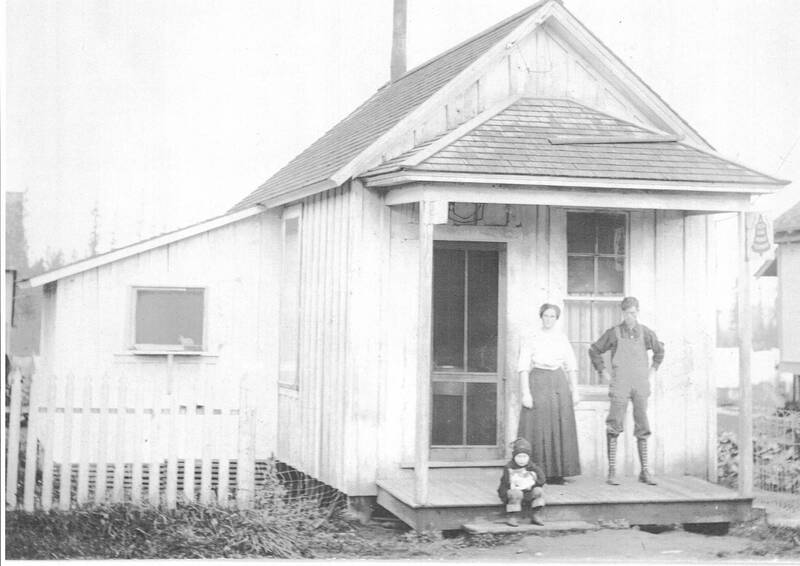 A black and white photograph of the Thomas family on the porch of the Tigard Telephone Office. Standing on the porch is Gertrude Thomas (to left) and Elmer Thomas (to right). Their daughter Helen sits on the edge of the porch. The telephone office is a one story, white rectangular building with a gabled roof and covered porch. At the front of the office is a doorway on the left side and a double pane window with a curtain in the lower half of the window on the right side. A small sign featuring the outline of bell is partially visible in the upper right-hand corner of the porch space. A one room addition containing a window is connected to the building's left side; a white picket fence and chicken wire run along the front of the addition. Mr. and Mrs. Thomas worked as telephone operators and lived in the office.